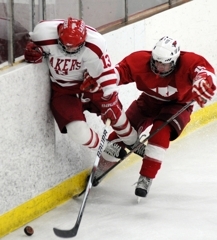 Detroit Lakes' Alex Mason (19) delivers a big hit (Photo by Tim Kolehmainen). 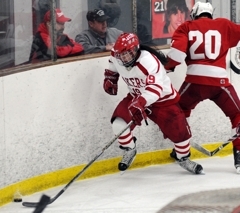 Willmar's Liam Johnston (20) knocks a Laker off the puck (Photo by Tim Kolehmainen). 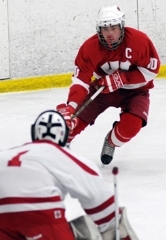 Liam Johnston tallied a goal in each period as Willmar surged past Detroit Lakes, 5-2 in a Section 6A rivalry game at Ken Freeman Arena in Detroit Lakes Saturday night. 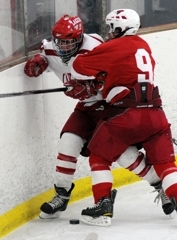 The Cardinals (5-5-0) scored three unanswered goals to break a 2-all tie late in the second period and earn the victory. 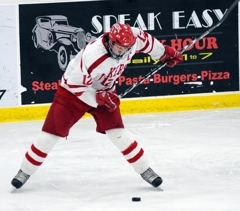 Johnston, a senior center, netted the game-winner with 3:52 remaining in the second, just after Detroit Lakes had rallied from a 2-0 deficit after one period. He picked up a loose puck at center ice, crossed the blue line and cut right while shooting back to the left. 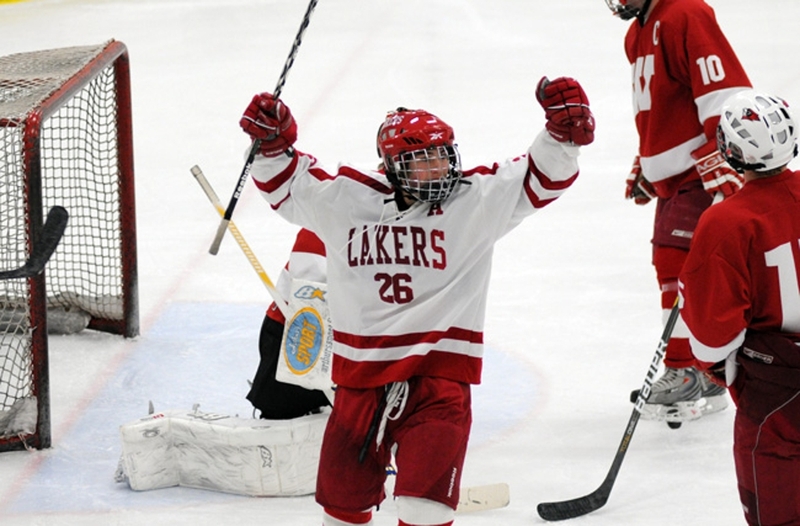 Willmar jumped on the Lakers early, as Tyler Bredesen scored before most fans had reached their seats. Just 12 seconds into the game, Bredesen took a pass from Gabe Amon and dented the twine behind Lakers’ goalie Blake Murphy. Six minutes later, Johnston scored on the power play to give the Cardinals’ a 2-0 lead. 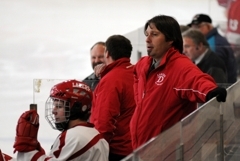 “We kept the puck in their zone, which generated some shots for us and got the momentum,” said Willmar coach Dan Tollefson of the early outburst, which was keyed by his team’s foot speed. But it didn’t last. 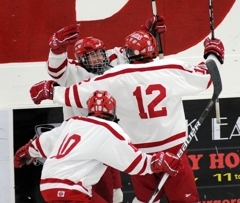 Detroit Lakes got an earful from Denardo between periods and came out buzzing in the second. Goals from leading scorer Nate Baker and a rocket from Andy Schupp tied the score midway through period two. 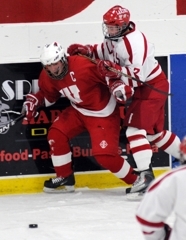 “Their whole tone changed in the second period and they jumped on us,” said Tollefson. 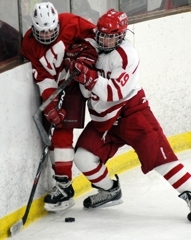 But just when it appeared the game would go into the third tied at 2-all, Johnston struck again. 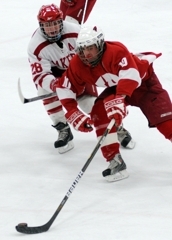 The game’s final two goals came during a 5-on-3 power play early in the third period that ended any suspense. 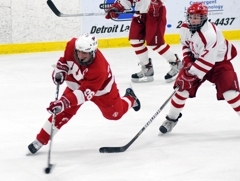 Just seven seconds after Detroit Lakes (8-4-0) was called for questionable back-to-back tripping penalties less than two minutes into the third, Johnston ripped in his third goal of the game. Grant Schow followed with another power play goal 44 seconds later that stretched the lead to 5-2. “That was the deciding factor, plain and simple. It can’t get any more clear cut than that,” said and obviously disappointed Denardo of the penalty calls. “That was the difference today,” agreed Tollefson, whose team was 3-for-6 on the power play in the game. 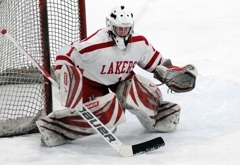 Murphy faced 40 shots and made 35 saves for Detroit Lakes. 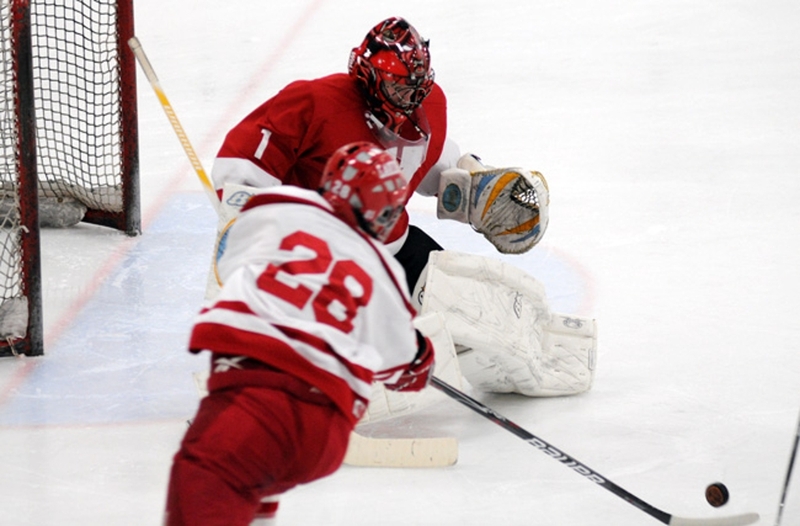 Christian Yrttimaa, a foreign exchange student from Finland, played a solid game in nets for Willmar, making 31 saves on 33 shots. 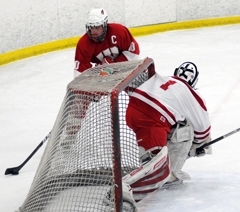 Christian Yrttimaa stopped 31 of 33 shots for Willmar, including this one against Ethan Brekke (Photo by Tim Kolehmainen). 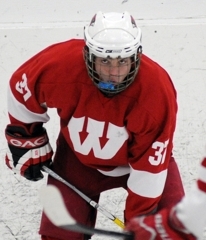 When Willmar opened the season with five losses in six games, coach Dan Tollefson wasn’t worried. He knew that the Cardinals had so much more talent and experience than they had showed heading into the holidays. 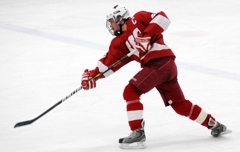 Liam Johnston and Willmar’s senior class took matters into their own hands. 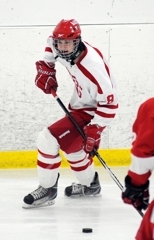 In four straight victories since Christmas, the 6-foot-1 center has five goals and six assists, including a hat trick in Saturday night’s 5-2 win at Detroit Lakes. 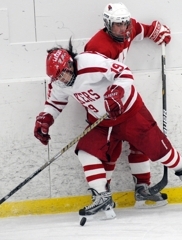 “We’re starting to play a lot grittier, getting hungry around the net, driving the net and drawing penalties,” said Johnston, who described a lack of intensity at the beginning of the season. Johnston exhibits those same winning traits. He has good size (6-foot-1, 170 pounds), which allows him to dish out punishment in the corners and fight through checks. But he also has soft goal-scorer’s hands, which led to a team-high 25 goals last winter. 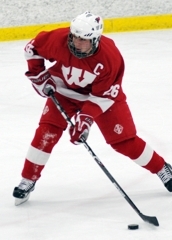 The recent outburst brought Johnston’s season totals to six goals and nine assists, shy of his pace from last winter, but moving in the right direction – as is his team. 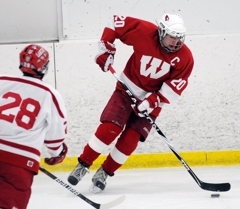 Johnston and much of Willmar’s senior class has been playing varsity since they were sophomores. They know this is the final chapter in their careers. “This is our chance. 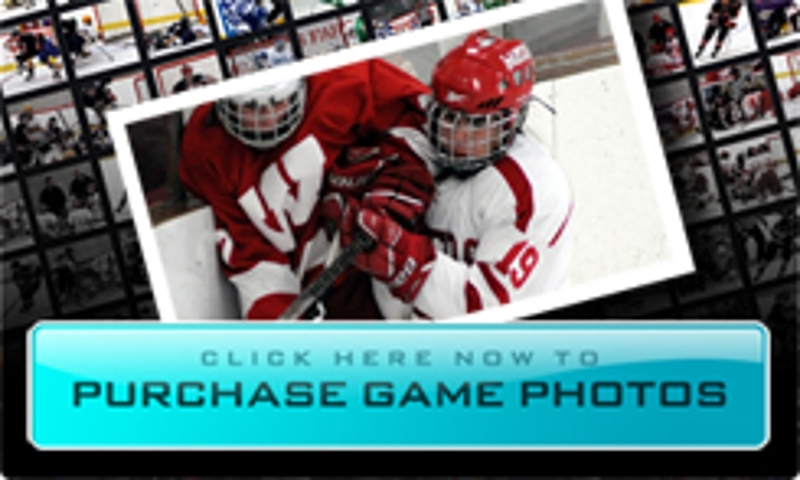 This is what we worked for,” said Johnston. 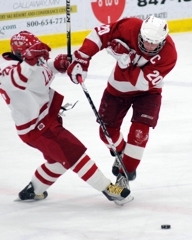 Detroit Lakes' Andy Schupp (26) celebrates his goal in the second period (Photo by Tim Kolehmainen). 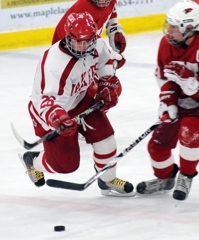 Johnston, a senior center, recorded a hat trick for the Cardinals, scoring a goal in each period. 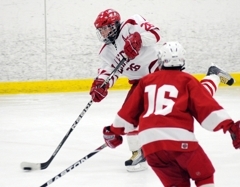 Two of his goals came on the power play, a key for Willmar in its victory. 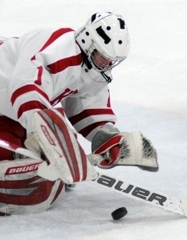 Yrttimaa, a senior goaltender, stopped 31 of 33 shots and was busy at times during the game. 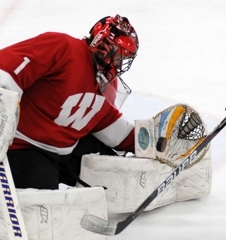 The Finnish exchange student has been solid between the pipes this winter, replacing the graduated Ben Leitch. 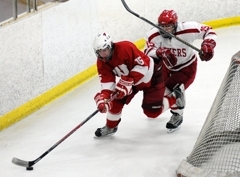 Schupp, a senior forward, was in on both Lakers' goals in the second period. He assisted on the first goal just 2:50 into the period, then ripped a rising shot into the top shelf midway through the frame, tying the score at 2-all.